Cool! If anyone else is around text and I'll let you know where we are. There's some kind of zine festival on Saturday. https://www.facebook.com/events/644878782293054/ Anyone fancy it? Got to go to Leicester after, but I'm hoping to nip in early doors, yep! Anyone going for the Martha/Wimpshake double at Rough Trade on Saturday? I believe Martha are first on at 11am. Wimpshake are on outside at 10.30. May pop over for that, haven't been to Rough Trade yet. Heya, any of you guys coming out to see us (okinawa picture show) play JT tonight? We're a full band now so a bit different to when we last played Notts as an acoustic thing with Onr happy island and wendy D's. The planning application for the flats inbetween the Chameleon and the Malt Cross has been refused. Which is nice. 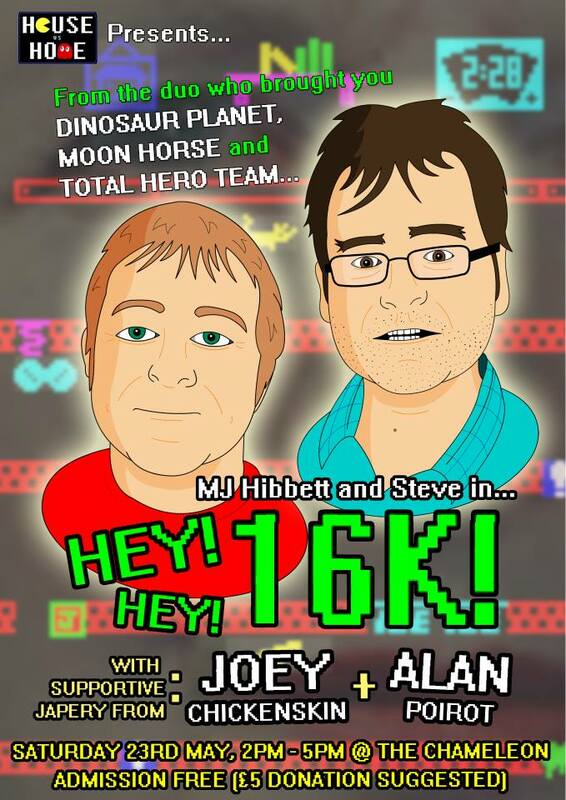 Facebook is cocking up event promotion beyond belief, so just a reminder (or, indeed, an announcement) for anybody who might be interested: MJ Hibbett (and Steve) will be doing their new two-man show, Hey Hey 16K, at the Chameleon (bar bit) on Saturday afternoon, with support from Joey Chickenskin and Alan Poirot. The event is 2pm-5pm, and kids are welcome though Joey Chickenskin sings 'spunked' in one of his songs. We're doing it as a 'Totally Acoustic', so free entry on a donation basis, with a suggested donation of £5. Ooh, that would've been nice. But I can't... is this one of your gigs? Anyone off to see Alvvays on Thursday? a layer of chips wrote: Anyone off to see Alvvays on Thursday? not me. I'm going to some gig at JT Soar that evening because I'm too punk for the Rescue Rooms. You're giving up smoking. Least punk punk ever. Hi! Putting on a gig tonight at JT Soar, aren't I. Bellies (featuring Nat from the Jelas), Towel (featuring Roxy Two White Cranes/Grubs/Joanna Gruesome) and Losing Sleep (with special guest appearance from Bad Phil Booth on bass). All ages. BYOB. Doors 8pm. Hope some of you can make it or else I'll sulk all my way through the alldayer. Hoping to get down! It's about time I actually went to JT Soar, I guess.